ready to grow your HEART-CENTRED business?! I see you there - you’re SO ready to take your business to the next level (or 10!). And you want to do it all in a super high vibe way that utilises your manifesting superpowers! In this FREE 2 Day LIVE Mini Course, I’ll be sharing with you my 6 steps to business growth using your menstrual magic! THE MENSTRUAL MAGIC MINI COURSE IS FOR YOU! 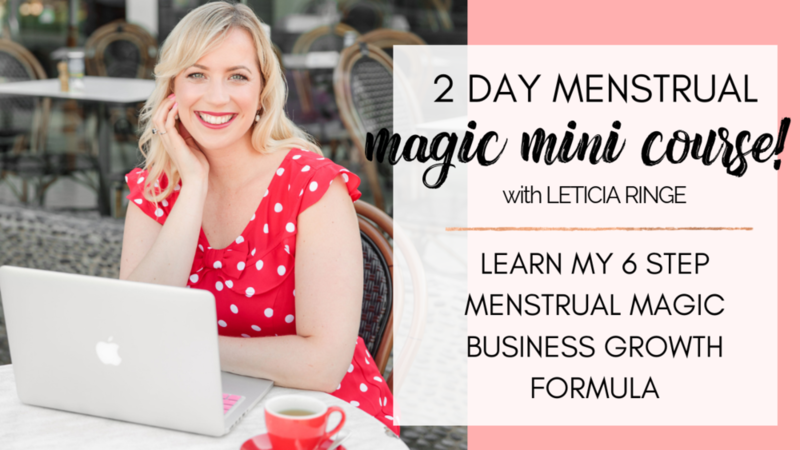 Join Leticia over 2 days to learn her 6 step Menstrual Magic Business Growth Formula! Leticia is an Award Winning Life & Business Coach, Manifestation & Menstrual Cycle Expert, Speaker and Host of the Create a Life that is Beautiful Podcast & TV. She helps high vibe babes manifest their dream life & business using their Menstrual Magic! Guiding her community through all stages of the entrepreneur journey from finding purpose to creating & growing a heart-centred, conscious business. Leticia will support you to live in flow with your cyclical wisdom to embody your freedom lifestyle, manifest like a #BossQueen and earn a living sharing your unique gifts. It’s time to make a difference and thrive while doing it! Giveaway prizes to be won for those participating in the mini-course (bonus points if you also share this mini course with your friends and tag Leticia on the Gram @leticiaringe). A community of high vibes babes in business! Please register for the training so that I can let you know when we are live and send you the replay. You must be registered to be eligible for the bonuses. So excited to see you all there, we always have so much fun in these trainings! Please check this box if you would also like to be subscribed to receive details of future trainings, content & inspiration to assist you in creating a life that is beautiful! Thank you! Please check your inbox to receive the access details. Make sure you check your spam box. See you on the 17th of April!